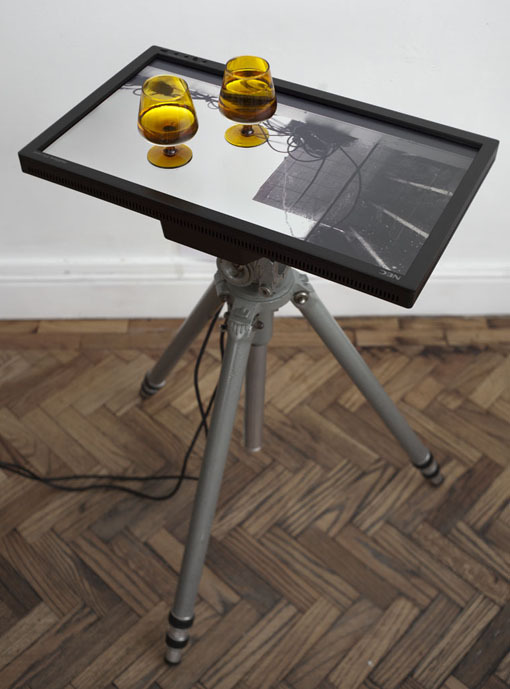 George Eksts uses video, photography and sculpture to explore ideas of progress, completion and the temporary. His ongoing series of 'Endless Videos' are explorations of alternative forms of time, challenging the linear historical structure of traditional filmmaking. Bereft of narrative progress and taking repetition to extremes, they question human and technological advancement and notions of completion and permanence. Conceived as a modular system of related yet independent pieces, the work does not exist in any specific state but rather in a constant cycle of rearrangement, development and documentation. Photographic and sculptural works appear both alongside and within the videos, inviting the viewer to speculate on the temporal and spatial relationships that are being formed and broken. Eksts earned his MA from the Royal College of Art and a BA from Falmouth College of the Arts. His awards and residencies include the Royal Academy Schools Fellowship and Cité Internationale des Arts Residency, Paris. He has exhibited internationally, with recent solo exhibitions at Hayward Gallery Concrete, London, and Fondation Ecureuil, Toulouse, and group exhibitions with Bloomberg New Contemporaries at the Liverpool Biennial and ICA.